AmplideX® technology has revolutionised how repeat expansions within the FMR1, C9orf72, and TOMM40 genes can be analysed, significantly expediting time-to-result and reducing the reliance on cumbersome Southern blot analysis. The AmplideX® PCR/CE DMPK Kit extends this groundbreaking approach to the DMPK gene, which has long challenged laboratory analysis due to the presence of very large expansions (over 1000 repeats) and a high degree of mosaicism. The AmplideX® DMPK kit, which is for use on widely established CE systems, overcomes these challenges and enables the sensitive detection and sizing of these DMPK repeats all within a single laboratory shift – without the need for Southern blot confirmation. Shares a common workflow with existing AmplideX® products, like FMR1. Go from DNA to data in a single laboratory shift. Runs on established platforms and eliminates need for Southern blot. 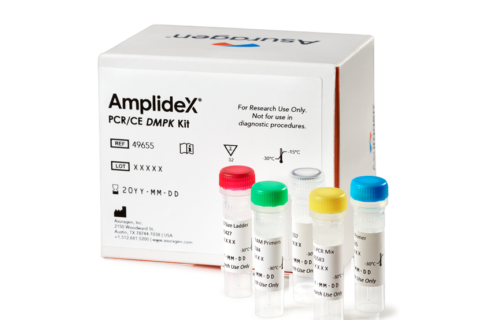 Find more information on the product page for AmplideX® PCR/CE DMPK Kit or download the product brochure. Contact VH Bio with any questions about this new product or to place an order with us.